So you both are ready for some backpacking in Asia? I will tell you how you can 'survive' a trip together, and a couple of suggestions on ideal couples destinations. Backpacking together in foreign territory will definitely test your relationship. If it goes well, then fantastic! Your relationship will become stronger. If it breaks after the trip, the relationship was already broken before you started. The trip just accelerated the process (pardon the bluntness). This way, you'll avoid most of those arguments about "we didn't plan this," "it's an expensive hotel", "you're a cheapskate" or whatever. Trust me, too many of these arguments doesn't exactly set the mood for travel and other things if you know what I mean. Fighting with your partner can be more devastating because there are so much feelings involved. What is your budget? How much money should each of you save? Where should you stay? Means of transport? This is important so you avoid all money-arguments. Let's say your partner is a full-time student with a part time job, and you have a full-time job. You have more money to spend and would like to spend some extra time at a fancier guesthouse, but your partner doesn't. Or both of you have a full-time job, but have different comfort levels. You compromise. Meet in the middle. 50% hostels and 50% budget hotels, whatever gets you going. Or 70% ground transportation and 30% flights. Where should you travel? What is the purpose of your trip? And what activities do you want to do together/separately? You may have the same interests, and you may not. Either way, find out the purpose of your trip. Party trip? Cultural trip? Trekking trip? Beach trip? Combination? Doing stuff together is just fun and it's why you're traveling together to begin with. But if you want to do things separately, this should be discussed before you travel. One might like trekking a lot more and the other one wants to spend a whole week on the beach. What kind of activities you're more keen on affects the choice of destinations and determines the itinerary. Me and my boyfriend are almost two opposites on the activity area; I love the beach and can just lay there without lifting a finger for two weeks, while my boyfriend gets restless after one day on the beach. We always have this deal that I join him for treks and hikes, and he spends extra days on the beach with me. It works as long as you have an understanding of things. As long as you communicate, nothing really bad in the (travel) relationship can go wrong. Between the "honey, where should we go now? ", and "when does the bus leave? ", remember to talk about your feelings once in a while, especially if something's bothering you. It's not the time to play guessing games. If something's bothering you, just be honest. Yeah, the other one might get upset because of the honesty, but that's a whole lot better than carrying on like everything is fine. Whatever is bothering you will tear you apart, and probably increase the odds of tearing your travel relationship apart. This might seem obvious, but having each others backs is alpha omega. It's easy to forget this when you're having a good time or want to have a good time, or you're in distress. You have to trust each other about everything. Doing separate things is only good for your relationship. Everyone needs a break, even from your partner, for whatever reason; "my special time", "my writing journal time", "my relaxing time". Don't forget to have those dates while you're backpacking. Just because you're traveling doesn't mean you should stop the relationship. This is what separates you from being just travel buddies. While you're chasing buses and bargaining rupees, it's easy to forget that you need to rekindle the love. I just love Varkala in India! The laid-back atmosphere, the sounds of the waves and hammocks in the horizon. Trust me, if you like hanging out at a good beach, Palolem is a very good choice. A tiny beach on the Southern tip of Goa. It really doesn't matter which beach you choose in Malaysia, many of them are beautiful with white sand beaches and crystal clear water. But my favorites are the Perhentian Kecil and the small islands outside Semporna (Mabul, Kapalai). Mui Ne is less touristy than it tourist magnet Nha Trang, and this is where backpackers, couples and singlers hang out. Phu Quoc island is a hidden gem in south Vietnam, in spitting distance from Cambodian border (Ha Tien crossing). Go diving, explore the beach and waterfalls! This is some of the romantic moments you can have in Thailand - during Loi Krathong in Chiang Mai (November each year). Lots of candles and then firing up lanterns in the sky. The look of it makes me wanna melt inside - welcome to Pura Saraswati temple in Ubud - the cultural center in Bali. What will you learn from a backpacking trip in Asia? You'll get to know each other in a different way, both good and bad. Things you wouldn't have discovered back at home. How does he react to pressure after a tiring 14-hour bus trip? Man, she has no sense of direction - and now we're lost. Didn't know she liked really spicy food. She wasn't as picky as I thought. Hmmm... he's a fascinating swimmer. Holy ****, I've never seen this temper before. You both will be exposed to various situations; taking a train together, border crossing together (which can be a challenge certain places in Southeast Asia), get lost together, bargaining at the market together and so on. So, you'll learn a great deal about each other, and you'll also learn more about yourself - as an individual and as a partner. I most definitely believe that you both will change after a backpacking trip in Asia. Do you want to learn more about itinerary planning? How to connect the dots? 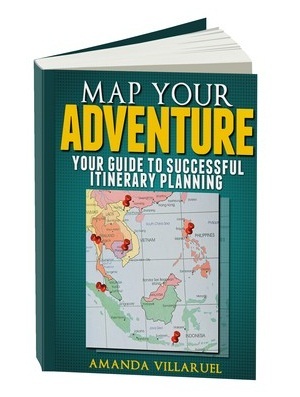 This article is a taste of what you can expect in our ebook "Map Your Adventure." This guide takes you by the hand on how to create an itinerary to suit your needs. The book covers Thailand, Laos, Cambodia, Vietnam, Malaysia, Indonesia, Singapore, and India. Check out the ebook here.